Basketball has begun at Orcas Island High School with full varsity and junior varsity teams for both the boys and the girls. The OHS teams are looking forward to strong seasons, hopefully with another run at state. Practices have been looking great for the teams. The first games were played on Friday, Dec. 1. The girls varsity beat Bush Academy 38-23. At the end of the first half the score was tied, but OHS worked and communicated effectively in the second half to achieve a convincing victory. The girls are 1-1 in conference play defeating Concrete 53-23 and losing to La Conner 43-35. 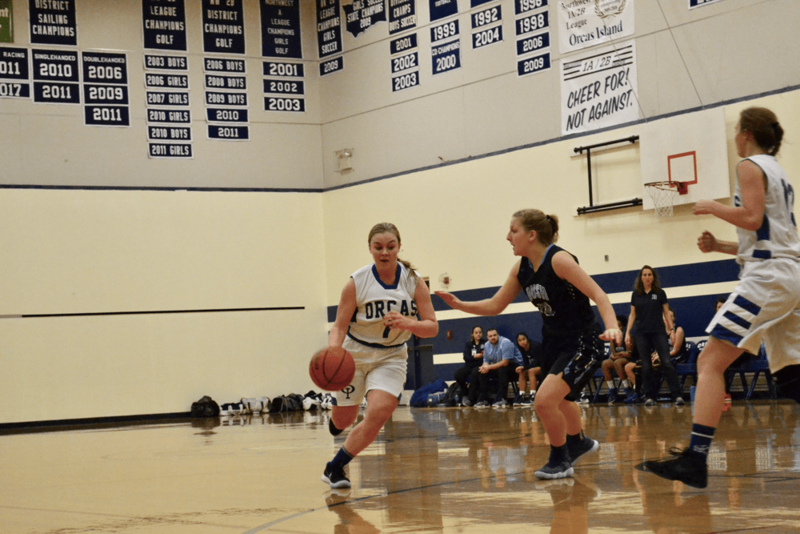 Girls junior varsity lost 31-29 against Friday Harbor on Saturday, Dec. 2. The the varsity boys team lost their opening game against Bush Academy on Dec. 1, but are currently 2-0 in conference play having beat La Connor 47-40 and Concrete 45-43. The boys junior varsity team beat Bush Academy 57-43 in their opening game on Dec. 1. In conference games they have beat La Connor 50-39 and Concrete 47-31. The girls team, coached by Greg Sasaan with the assistance of Amber Paulson and Haley Winchell, has a great lineup of players from all grades. The varsity team includes Katelyn Minnis, Journey Howden, Jessica Nichols, Joïe Zier, Maia Lewis-Shunk, Brittney Kern, Arla Sutton, Alanna Lago, Joanne Mietzner, Birdie Greening, Lindsey Simpson, and Olivia Brunner-Gaydos. The junior varsity team consists of Ariah Howard, Astasia Monahan, Camryn Thompson, Destiny Wright, Emma Rogers, Evie Smith, Flora Lister, Grace Gustafson, Helena Auger, Izie Janecek, Madison Todd, Portia White, and Sofia Fleming. The team captains are Katy Minnis and Jessie Nichols, who are combining their strengths to lead the team into what we hope to be a strong season. The manager for the girls is Phaedra Osborn. “We have a lot of young people on our team, and it’s looking to be a good season. Orcas Lady Viking basketball is looking great for the future, too,” Zier said. “It’s nice to have a team that supports you and has your back when you need it,” Kern added. “This is the season we will be remembered by. This is our legacy,” Minnis said. The boys team is coached by Corey Wiscomb with the assistance of Willy Clancy. The varsity team includes Ivan Bullock, Hayden Simpson, Matthew Mullan, Yusuf Duni, Kellen Maier, Garrett Ballanger, Kupono Anuenue, Ciaran O’Neill, Max Clark-Mattila, Tomas Holmes, Leif Gustafson, and Daniel Keyes. The junior varsity team consists of August Groeninger, Leonai Van Putten, Douglas Ha, and James Jensen. The team captains are Ivan Bullock and Hayden Simpson.